Due to overwhelming demand, the positive feedback and some shows where stock wasn’t available and some shows where people couldn’t get in because they were sold out, we wanted to make the 2017 From Boston To Berkeley Challenge Coins available until supplies last. 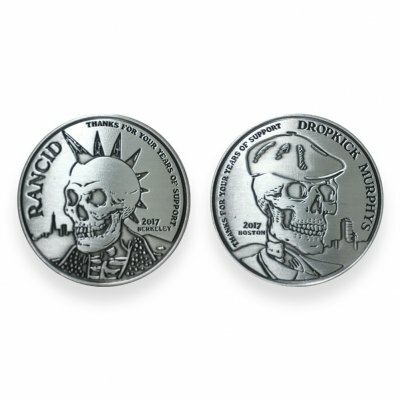 We sold these coins throughout the tour, and it extends the charitable work that Rancid and Dropkick Murphys have both done for years. 50% of the proceeds will be donated to www.musack.org – to help with musical instruments and musical education for kids. The other 50% will be donated to the www.claddaghfund.org to combat the spreading opioid epidemic with treatment, prevention, and education programs throughout the northeast. WHEN THEY’RE GONE, THEY’RE GONE. These are antiqued nickel plated brass coins – they’re heavy, they’re detailed, and 100% of the money goes to a great cause.